I like romance in my books. Big fan of it, in fact. Big, sweeping, epic romance is right up my alley, and considering how fussy I am with most thinks I’m remarkably happy with any kind of romance. Heterosexual, homosexual, pansexual, it all works for me. Hell, I’m even secretly hoping that Jaime and Cersie will work things out, those crazy kids. So, yes, I like the romance. But, and this is an important distinction, I tend to not like romance novels. * The reason why I don’t like romance novels was clearly illustrated to me, in case I had forgotten, when I decided to read Gail Carriger’s 'Soulless.' 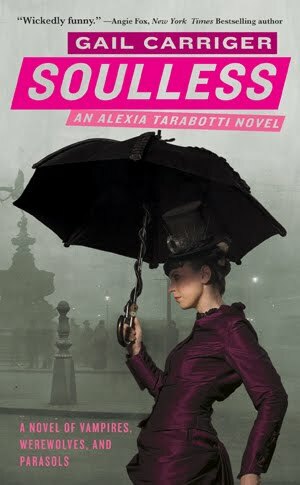 'Soulless' had a cool sounding plot, and a eye catching cover, and I’d seen it described as ‘mannerpunk’ which tickled my fancy, so even though I knew it was technically a romance novel, I still picked it up. It’s set in your standard Victorian steampunk world, one wherein Vampires and Werewolves live out in the open and in relative peace with normal humans. Alexia, our heroin, is unfashionably Italian, and entirely without a soul. I could not stop thinking about the Simpsons' episode where Bart sells his, but Alexia seems to suffer none of the problems that plagued Bart. Instead the only real ramification seems to be that whenever a vampire or werewolf comes into contact with her, they are rendered wholly mortal. Pretty cool idea. And there are plenty of those in this book. The world is well drawn and interesting, and the characters are fleshed out nicely. I was a big fan of Alexandria’s flamboyant vampire friend and his army of well dressed spies, who in my opinion did not get nearly enough page time. Of Alexia herself, well. Not a fan, let’s say. Which I’ll freely admit is all on me. I’m just not a fan of that particular breed of female character. Overly stubborn, quick to offense, ridiculously opinionated and Quirky with a capital Q. (First person to suggest that I dislike them because they remind me of myself gets a whollop.) They just annoy me, and Alexia is the worst I’ve seen in a while. But, despite my personal misgiving, she’d still well crafted and I don’t doubt many out there will like her. Despite these negative words, I don’t doubt for a second that a lot of people would enjoy this book. (And I know for a fact that Carriger has a huge following). It’s well written, and the romance between Alexia and Conall is engaging. I just wish that there was more to the book then just the romance. *Please note that all comments about the romance genre are my own opinion. I’ve read very few romance novels and am in no position to comment of the genre as a whole with any kind of authority authority. Peace! Liked reading your thoughts on this. I recently re-read this book for a book group, and had more of a mixed reaction to it than I remembered from the first time reading.